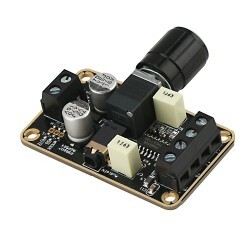 It's a 2 Channel 3W+3W mini digital amplifier,operating voltage: DC 3~5.5V,Efficiency: 90%, It ha.. It is a 2 x 5W Dual-channel Class D Digital Amplifier, Working voltage: DC 5V (please don't use m.. It is a small digital uses PAM8403 chip amplifier circuit using the most reasonable peripheral configuration, output 3W +3 W high-fidelity sound, is a very good product for amp enthusiasts. PAM8403 Mini Power Amplifier Board. Suitable for battery or portable electronics products,suitable for long time steady usage.